President Obama visited the wildfire-ravaged landscape in the foothills of Colorado Springs today, calling it a "major disaster," and pledged to release federal funding to the counties affected. "The devastation is enormous," Obama said. "This community is obviously heartbroken." The Waldo Canyon fire in Colorado Springs, now considered the most destructive in the state's history, has devoured 346 homes and killed at least two people. 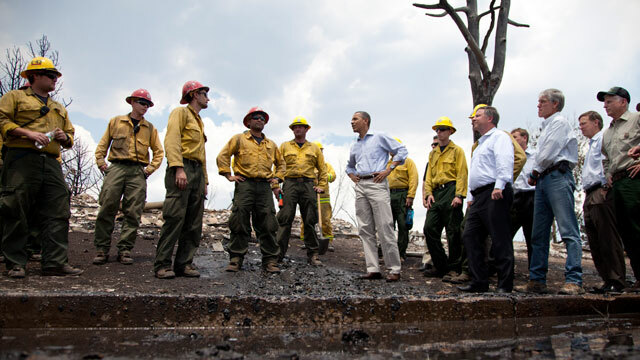 The president traveled through the Mountain Shadows subdivision of Colorado Springs today, where many of the homes have been burnt to the ground. During his three-hour visit to the state, he also met with firefighters, first reponders and evacuees. More than 16,000 acres have been destroyed since the blaze started Saturday. Only 15 percent of the fire has been contained. There was some good news today, though. After several days of severe heat and high winds that fueled the flames, weather conditions were expected to improve and cadets at the U.S. Air Force Academy were allowed to return to their campus. The Air Force announced this afteroon that it would activate all eight of its C-130s Saturday to spread fire retardant on the area. Just four had been used this week. The Air Force said it had not used all eight of its firefighting planes since 2008. "It's like someone just took their thumb and smudged each house out," said resident Glenn Miller. Rich Dunagan said his home was among 20,000 structures still in harm's way. "It's an ominous feeling and beauty to see fire threatening what you've come to know and enjoy, and frankly take for granted," Dunagan said. The cause of the fire is unclear but officials will investigate to determine whether arson played a role, El Paso County Undersheriff Paula Presley told ABC News in an exclusive interview. "It's really important that they [firefighters] get to the point of origin before we can ever get to that determination," Presley said. Click here to read the entire exclusive interview with Undersheriff Paula Presley. "Anytime we have a fire of undetermined origin, we're going to treat it as arson. ... To ensure that it is thoroughly investigated and we get to the point of origin and make sure that either rule out arson, or determine that it is arson," Presley said. The investigation will have to wait, though, until the fire is under control. "This in many ways is a type of terrorism where somebody is trying to destroy an entire city, essentially," Presley said. "I'm a native here. I've never seen anything like this." Aerial photos revealed the scope of the devastation. Tempers flared among anxious residents waiting to find out the fate of their homes and some fought with officials to check on their homes to see if anything was salvageable. "You don't have the authority to tell me I can't go back into my house," one angry homeowner said. "I looked this up. I'm not flying off the cuff here. I have rights as a property owner." Evacuees were called to a meeting at the University of Colorado campus. Anne Marie Borrego of the Red Cross said a list was passed around with the homes that were damaged or destroyed. "It was a really tough meeting," Borrego said. "I kept thinking to myself how difficult it must be to wait for that list to actually be handed out to look for your own address and see if it was on it." Police continue to guard evacuated areas after two arrests were made for looting. ABC News' Mary Bruce, ABC News Denver affiliate 7 News and The Associated Press contributed to this report.